You register for courses in OSIRIS. You can only do so during a registration period. Every block has a fixed registration period and a few change days on which you can register for courses that still have space available. Shortly before the start of each block the so-called change-of-enrolment days take place. These are designated days just prior to the start of every block. From 9 am on these days, you can register for courses that still have places available. Make sure you are on time: many courses have only a limited number of places. We will publish a list of courses that are still open for registration a week in advance. Some courses have a limited number of places and therefore the decision has been made to set up selection committees. Selection is based on substantive grounds. A selection committee consists of a lecturer, a student advisor and a student. Generally, only Bachelor courses have selection committees. list with courses that have a selection commitee (bachelor and master). You can only register for the courses with a selection committee during the first week of the registration period until, at the latest, 16.00 on Monday November 5. After that time, the selection committee will proceed to place the students in courses. The time of registration has no bearing on the placement, so it does not matter at what time you register as long as you register before 16.00 on November 5. On Thursday November 15 at the latest you will receive a message in your student email telling you whether you have been placed in the course or not. After that time, you have the opportunity to register for another course until midnight on Sunday November 25. If you decide you do not want to take a course after all, you de-register via OSIRIS. This can be done during the change days prior to the block in which the course is given; after that it is no longer possible and an 'ND' (did not attend) will appear in your file. Reflection week: no classes and tests scheduled. Students and teachers are available for resits, reflection, feedback, tutoraat and information events. Courses/educational activities offered (in part) by other faculties than the Faculty of Humanities may diverge from this year calendar. 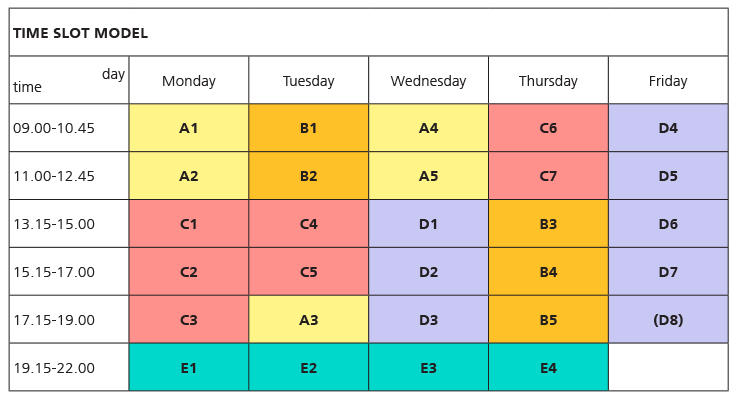 Those who want to plan ahead can consult the multiple year overview for the starting dates of the semesters, blocks and the Christmas break. Note: no rights can be claimed from the information in this calendar. For question or more information on course (de)registration, you can contact the Student Desk Humanities.